I decided to share some antique photos with you this week. 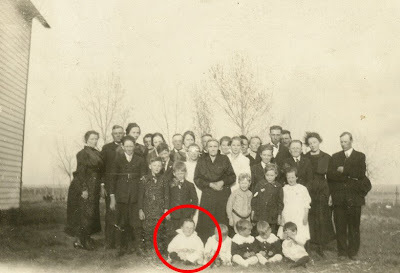 This is a photo of my mother, along with other members of Pleasant Valley Lutheran Church, just outside Kidder, South Dakota. My mother looks like she is about four or five years old in this photo which would mean it was taken around 1921. My grandparents are in the very back row. You can see about half of my grandmother’s face, just to the right of center. 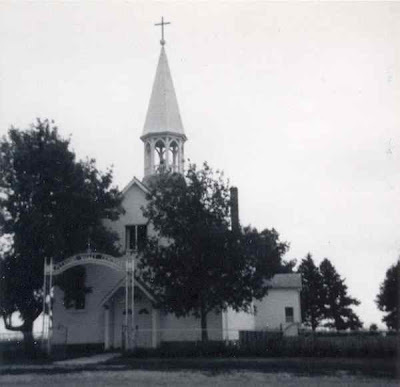 Here is a photo of the farm my mother grew up on, just down the road from the church. The land is still in the family — 160 acres, less a few (seven?) taken back for the railroad to come through. Initially, my great-grandparents lived in a sod hut, but this is the house that was later built. It never had indoor plumbing or electricity and is actually very small, although it looks large in this photo which was taken before my mother was born. That’s my grandfather holding up what must be my oldest uncle. My great-grandfather is on the left and my grandmother is on the right. My great-grandmother is the woman with the white hair. I’m not sure who the other folks are . . . probably neighbors. Wonderful pictures and the history too. You’re too smart. I took pictures of antiques and you shared antique pictures…a lawyer’s mind. I used to be a legal secretary. oh wow, what old pic. I love em! I love the house the most. Mines up. Those are some great pictures and they share some great history of your family. Isn’t it nice to know where some of your roots were planted at one time? That is so awesome! To have all those old photos are just super. Keep them safe. My parents didn’t take too many pictures when they were young. And the ones that we did have got lost in all the moves we made. I love looking at old photographs. It is wonderful that you still have them. I have a lot of old photos too. Don’t yopu think the photos tell a story all their own? Well I best be going. I’m still fighting this Flu. Thank you for sharing some history behind each photo. Excellent choice for the theme. Enjoyed viewing them all. Wonderful old photos. 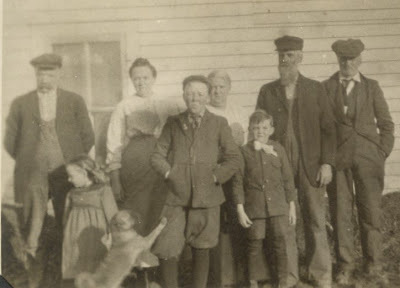 Thanks for sharing these bits of your family history with us. My mother also grew up on a farm with no electricity or indoor plumbing, although my uncle added those later when he inherited the farm. Oh, how I love old photos!!! Great choices for this week. You are so fortunate to have these and to know the history behind them. I think photography is such a wonderful thing because it helps preserve our family history. You must be delighted to have these old pictures. Great pictures! These are surely treasures. I sometimes wonder which of my photos will survive. I don’t think the digital printing will have the same durability as film. I love the old photos, especially the men, almost always with their hands in pockets or stiff by their sides. My dad and uncles still pose this way. Very nice. Thanks for sharing your family photos! I loved your photos! great “take” on the theme this week! fabulous photos…wow great ones to treasure….thanks for the memories…. I *love* old pictures–even better when there’s such a personal story to go with them! Thanks for sharing your family with us. The history is amazing. The pictures are wonderful. Happy weekend. 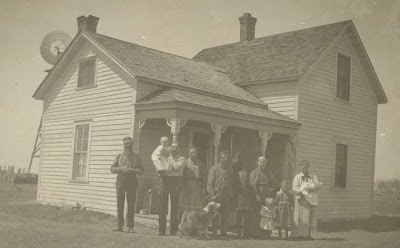 I love old pictures from the Dakota-states, where so many family members settled in the late 1890’s. Absolutely wonderful post. The photos are outstanding. What a history your family has. Wow! They really are old. Sorry wasn’t able to visit last week. These are great photos. A wonderful reminder of the past.